In many situations big and small, be it shopping for a car or a house, waiting to be seated in a restaurant or deciding about how much money to put in a business venture, we get anchors thrown our way. Unknowingly yet powerfully as by its definition, the anchor keeps us floating in our decisions in a range close to it. In a 1974 research paper” Judgment under Uncertainty: Heuristics And Biases, Kahneman, and Tversky conducted an experiment where they used a rigged wheel of fortune that only stops at 10 or 65. Then they asked participants an irrelevant question; what is the percentage of the African American nations in the US? Results showed that despite the lack of rationality in the wheel of fortune numbers being of any relevance to answering the questions. ‘rational’ participants still responded by staying close in their answer to the suggested number. They did it without knowing they were. They were staying close to the number where the wheel stopped, which Kahneman called the “Anchor”. The thing about Anchoring as a bias is that people not only are unaware of it, but they also deny that the original number impacted their decision. Yet, in fact research shows that any initial value suggested while you are making an estimate will influence you to stay close to it. Triggering, right? Have you ever gone to a restaurant and was told that the wait time was 30 minutes? The number 30 has created your psychological zone of what is acceptable. In that case when the wait time turned out to be 20 minutes you were very pleased. Had you been told the wait time was 10 minutes, you would have been increasingly frustrated by waiting for the same 20 minutes. The difference here was not in the actual waiting time, but in the anchor suggested. Do you feel a slight twitching in your right hand? Kahneman suggests that by suggesting this to you, I would in fact induce a feeling that you may have not had before. A twitch or an awareness of any other sensation in your right hand. The power of suggestion is a way to explain anchoring bias. Another explanation is that anchoring is a process of adjusting up or down from the suggested number and stopping when uncertainty about the new value becomes too high. At any rate, If I ask you whether Marilyn Monroe died in the age of 70 your estimate will come older than your answer if I had asked if she died at 25. It is unsettling if not terribly upsetting to think that our decisions are largely influenced by stimuli that we either consider irrelevant or are even unaware of. This threatens our sense of rationality, objectivity and autonomy. 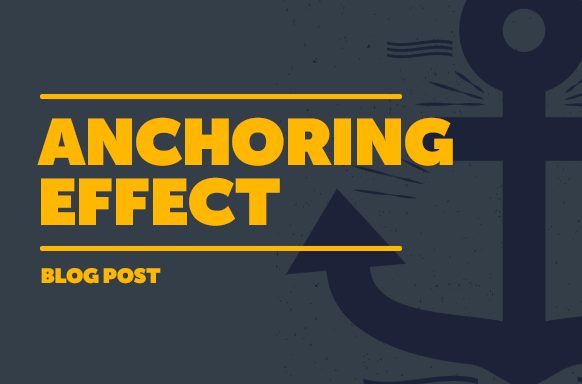 So, what is a way to combat the effects of anchoring? As suggested in Kahneman’s book ‘Thinking fast and slow’, it is by the deliberate mobilization of rational thinking. Psychologists Adam Galinsky and Thomas Museeweiler suggested an intentional act of ‘thinking the opposite’ of the anchor as a way to combat the process by which our minds produce relevant arguments and thoughts confirming our bias to stay close to the anchor. An argument supporting the deployment of intentional skepticism in making decisions as opposed to automatic piloting our judgments by relying on our intuitions and past experiences.